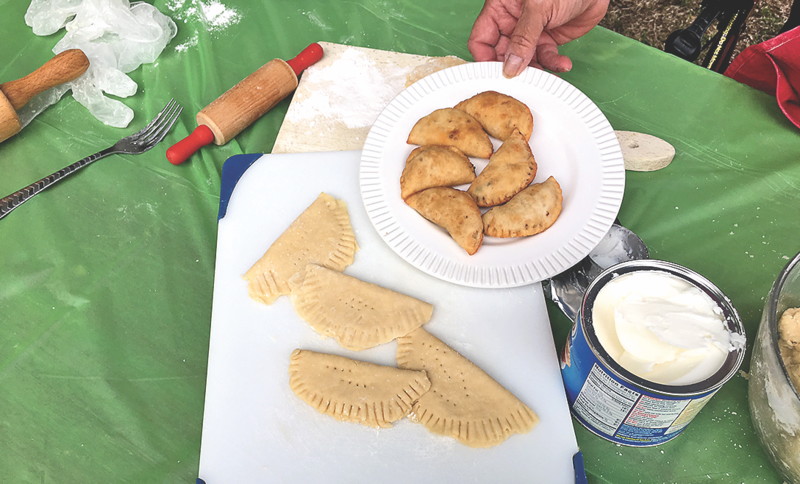 Photo of meat pie making at a previous Find Your Park Festival. Cane River National Heritage Area, Inc. (CRNHA) and the Cane River Creole National Historical Park (CARI) will host the Third Cane River Find Your Park Festival Saturday, April 27. Hosted at the Oakland Plantation Unit of the park, the festival will showcase the cultural and natural resources located in the Cane River and Red River regions. Events include hands-on activities for children, agricultural demonstrations, games and a petting zoo! “The Find Your Park Festival is an event we look forward to each year as we invite visitors of all ages to discover the National Park and Heritage Area in their backyard,” said Barbara Justice, CARI Chief of Interpretation. The third year of the festival will continue to feature other federal and state partners like the US Army Corps of Engineers, Kisatchie National Forest, and Fort St. Jean Baptiste State Historic Site. “This festival brings the park to life as it explores and celebrates the rich heritage of the Cane River and Red River regions,” said Justice. The Cane River Find Your Park Festival is free and open to the public. Activities will occur from 10 a.m. – 3 p.m. at Oakland Plantation, located at 4386 Hwy 494 in Natchez. Bike Natchitoches, a bicycle advocacy group for cyclists in the area, will host their 6th Annual Cane River Plantation Ride Saturday, April 27. The ride consists on three routes that cover land steeped in the history of Natchitoches Parish and offers numerous views of Cane River Lake. The 15-mile route will start and finish at the Cane River Creole National Historical Park (Oakland Plantation) in Bermuda. The tour will follow the Cane River National Heritage Trail and the Isle Brevelle Trail along Cane River Lake. It will pass several antebellum homes as well as Melrose Plantation and will cross Cane River Lake to the Isle Brevelle Trail by historical St. Augustine Catholic Church. It will continue to Cane River National Historical Park. The 25-mile route will follow the same route as the 15-mile route plus continue on to Magnolia Plantation. The tour will cross the end of Cane River Lake and continue on to the Isle of Brevelle Trail to Cane River National Historical Park. The metric century route will follow the same route as the 25-mile route and will add the beautiful, hilly forest scenery of the Kisatchie National Forest including the Long Leaf Vista Trail. A 2k family fun run/walk is free to participate in and will be on the park premises. Participants and families from any route are encouraged to tour the National Park at Oakland and Magnolia plantation at no extra fee. Melrose Plantation is offering a reduced fee for participants and families. Early registration will be Friday, April 26 from noon – 5 p.m. at the Grand Ecore Visitor Center, 105 Tauzin Island Road. There will be ride maps, gift bags and ride shirts on hand, as well as light refreshments and snacks. Late registration and sign-in opens at 8:15 a.m. and the ride will start at 9 a.m. The registration fee is $40 for participants 18 and older. Those 17 years and younger/students pay $25. It is an extra $5 per participants on the day of the ride. Register at www.bikereg.com or visit the Bike Natchitoches Facebook page.